Thank you 2015 for being my favorite of all my 28 years. 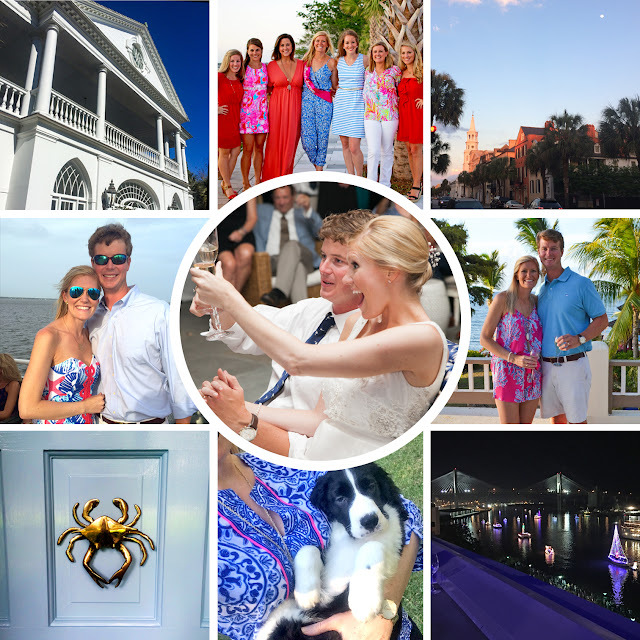 Between getting married, buying a house, and getting a puppy- my favorite thing about this year was spending so much time with all of my favorite people. It was so special to have my best friends all together in Hilton Head in May and then again in July, to have my family and friends all together in Charleston. So often I just see my cousins and family just once a year up in Pennsylvania so it was really great to be able to see them again down South! Thank you to everyone who helped make this year amazing! We visited Lowndes Grove during wedding planning and fell in loooove with that amazing second floor piazza (where my bridesmaids and I did our photos!) and the gorgeous architecture. My best girlfriends all traveled to Hilton Head for my bachelorette weekend. 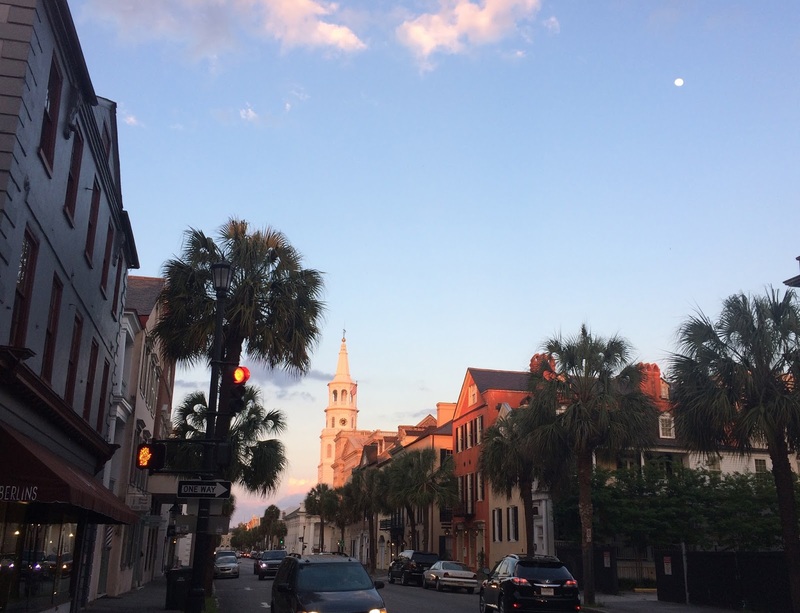 I enjoyed this view of Broad Street and soaked up the last of my Charleston days before the wedding. 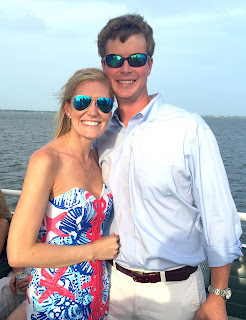 After our wedding rehearsal, Robbie and I celebrated the start of our wedding weekend with our bridal party and extended families on cruise around the Charleston Harbor on what turned out to be a gorgeous night. The best day ever. 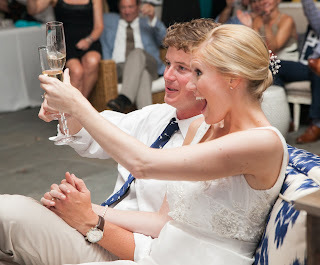 :) This was when we were toasting after my maid of honor's sweet speech! Robbie and I honeymooning in Antigua! 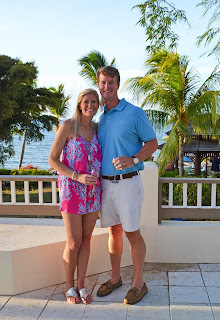 This was on our last night when Robbie surprised me with a little champagne happy hour by the pool! We bought a house! It wasn't a huge adjustment from Charleston to Savannah since they are both great coastal cities- see my post here about Sweet Savannah. I have loved getting to decorate and make the house more our style, and my first step was to paint our dark red front door a pretty coastal blue to go with the crab door knocker the previous owners had put on there. 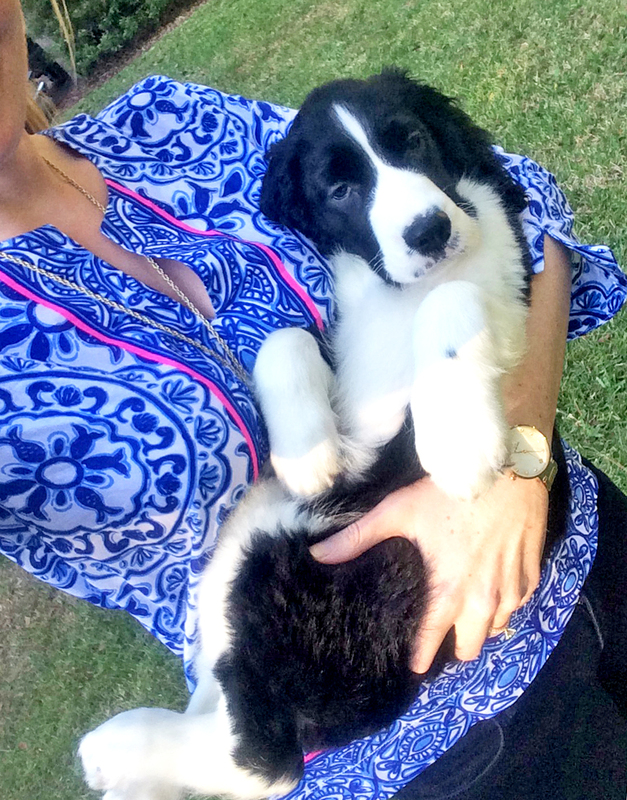 Our sweet Lucy pup entered our home at the end of September and is the best little assistant and photography subject! 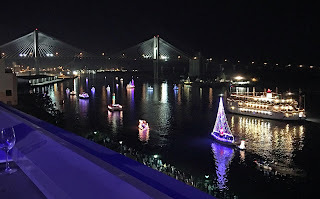 The boat parade in Savannah was a great kick off to the holiday season here. 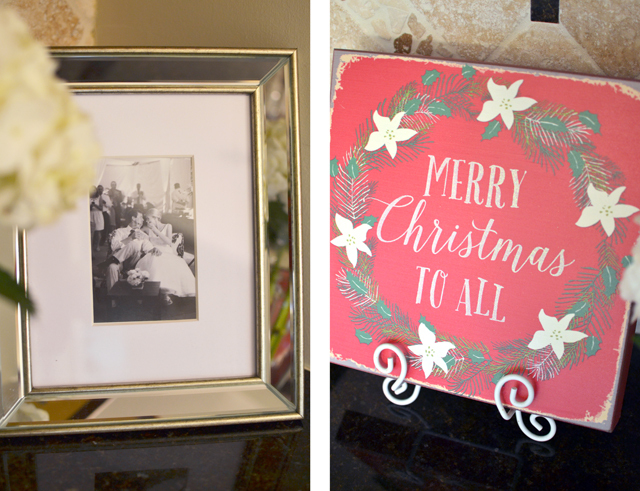 It was our first married Christmas and a great one at that! 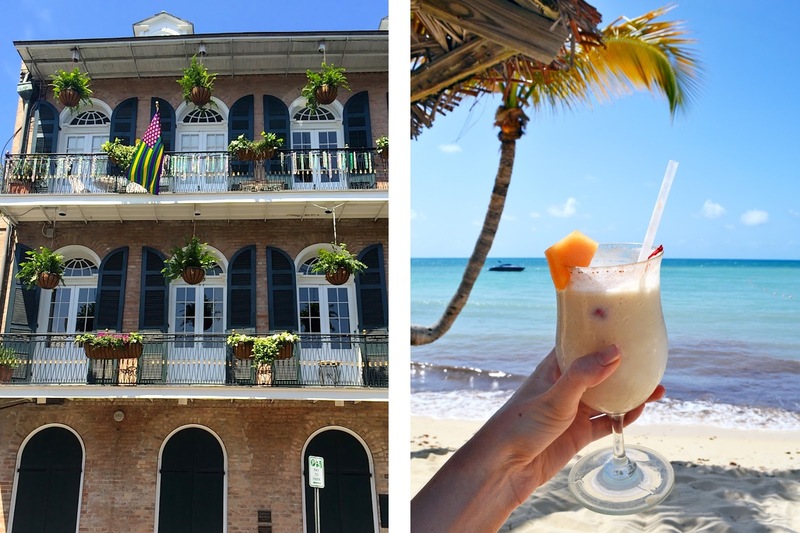 I traveled to New Orleans in March to celebrate my college bestie's bachelorette and had so much fun with some sorority sisters and old high school pals. Relaxing and soaking up the sun, sand, and lots of pina coladas in Antigua with my new husband was one of the best weeks ever! I loved having no schedule and being surrounded by this bright beautiful water! Moments after this photo was probably my favorite memory of 2015. After we ran through the sparklers, we turned around to see all of our loved ones one last time before we made our getaway, when my cousin Brooke broke out into the Star Spangled Banner (it was the 4th of July after all!) and everyone joined along. I think it was a combination of seeing everyone's smiling faces all at once, having just experience the best day of my life, and maybe a little bit of bittersweetness that the wedding was over but I quickly felt the happy tears roll down my face (and they're coming back now as I think back to this!) That memory will forever be in my mind as one of my favorite moments ever! 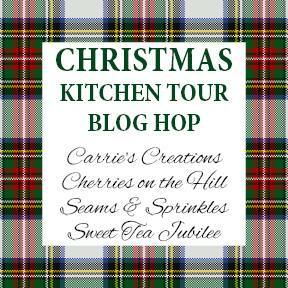 Today I'm teaming up with a few fellow bloggers to share our Christmasy kitchens! 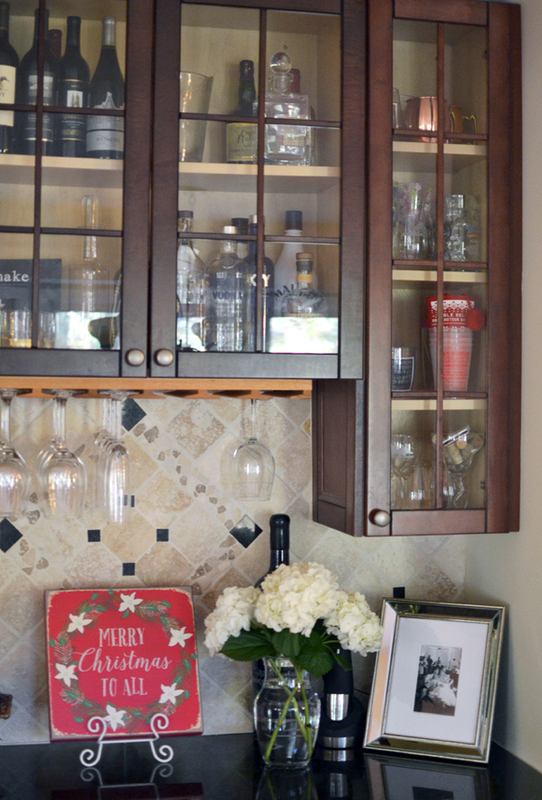 I have share bits and pieces of our home on Instagram and on my Fall Home tour but have never shared much of my kitchen! It was one of the rooms I was most excited about when we bought the house because I had never really had my own real (non-apartment) kitchen. I have grown to love cooking through my post-college years (I think the only things I "cooked" in college were microwavable or PB&J's) and so the kitchen has become one of my favorite spaces. 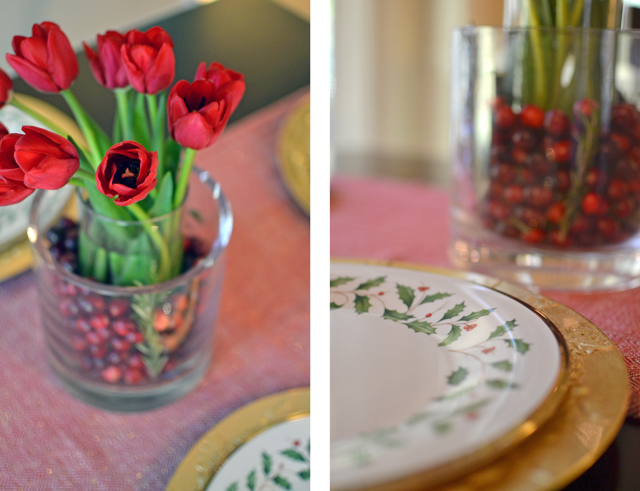 Our table is set pretty simply because to be honest, when you decorate your first home for Christmas it can get quite expensive! 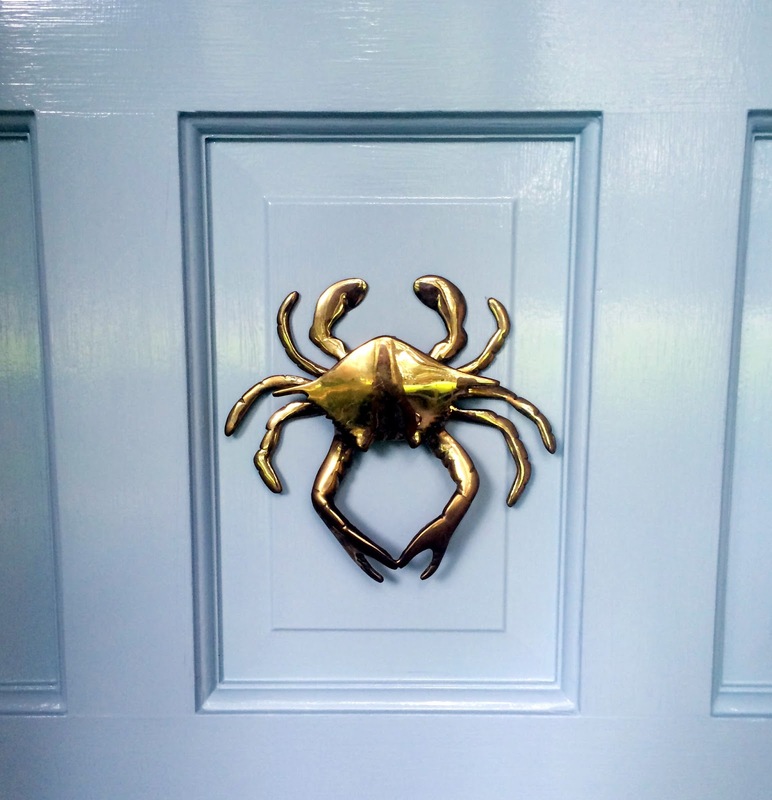 I had lived in smaller apartments before and had a few decorations here and there but nothing too serious so we had to start our collection! I found these plates and chargers at Home Goods but you can find a set of dinner plates here. 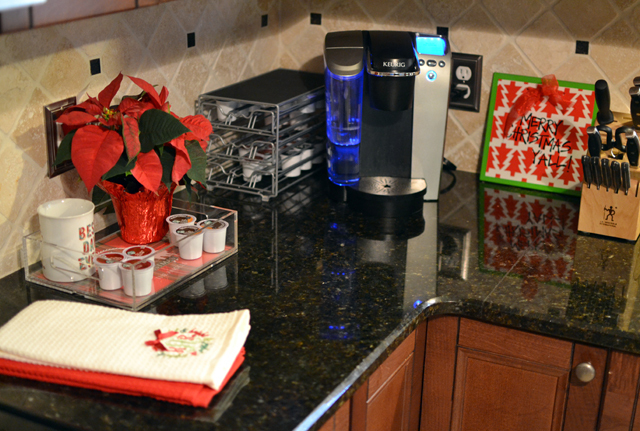 We have friends coming this weekend so I thought it would be fun to set up a little holiday coffee/hot chocolate station. Some of my other Christmas mugs are in the dishwasher but I hope to have more out on the counter. 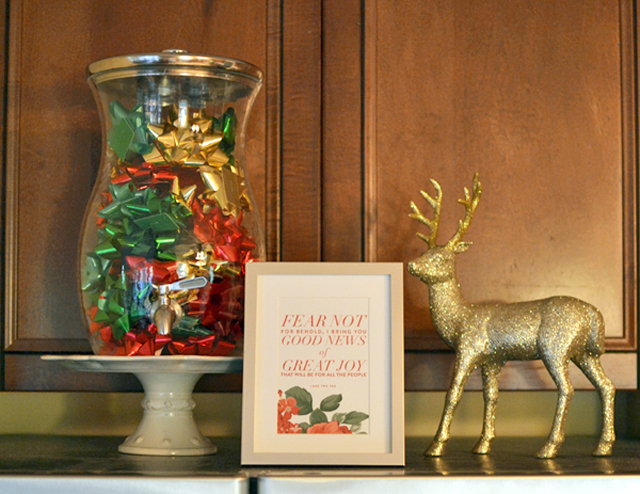 This plaid personalized tray from Emily McCarthy is a new favorite thing for the holidays- I wish I could keep it in my kitchen all year round! Originally, I had wanted to share a favorite holiday recipe in this post to go along with our kitchen but nothing really stood out in my mind... well except for these Peanut Butter Blossoms but I've been trying not to keep a lot of sweets in the house. 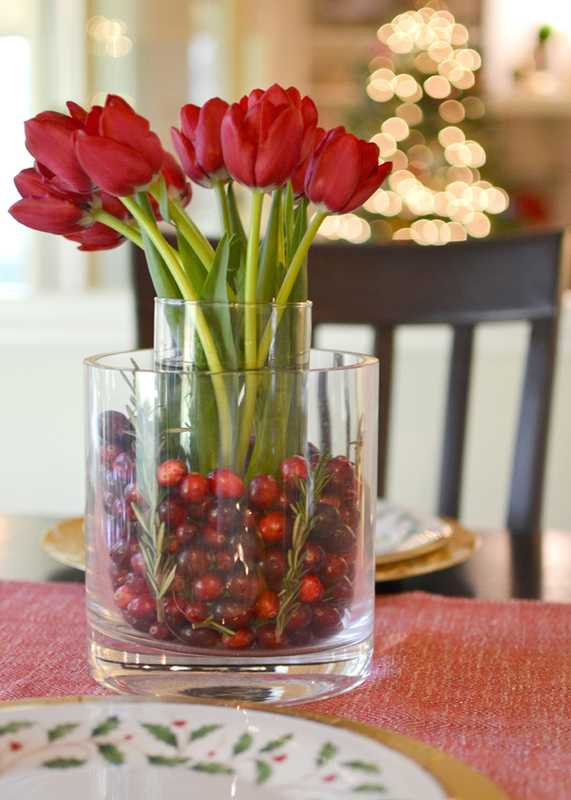 Instead of a recipe that you can actually eat, I wanted to share a recipe for a fun holiday decoration. I guess these were not a tradition in Robbie's family because when he came home the other day and I had started my first orange he was so confused! I think the yummy smell of the cloves has won him over since though! 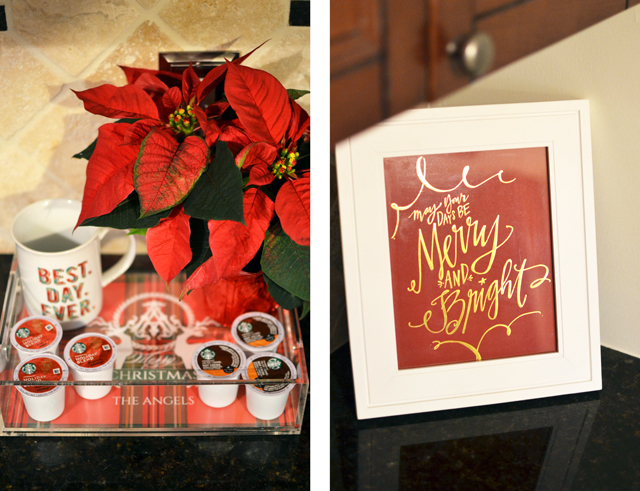 This is such a fun and easy little DIY that you can do for the holidays and maybe you can start your own traditions this year! 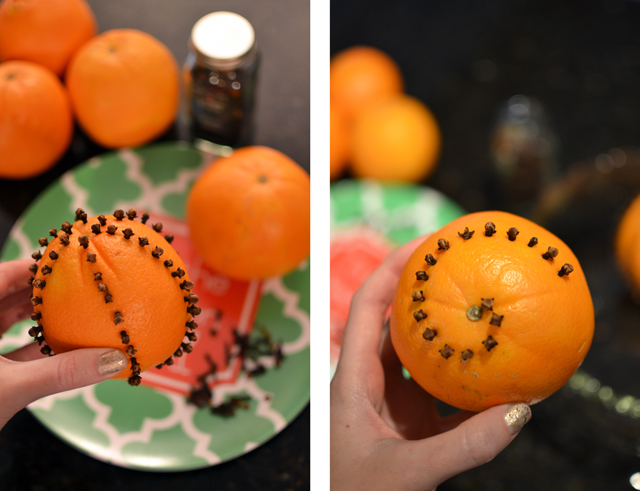 After my first orange, my finger had started hurting from pushing the cloves through the orange peel when I realized that if I pierce it with a skewer first it not only was easier to stick the cloves in, but also easier to create your own design! You can add ribbons or other embellishments for the pomander of your dreams! 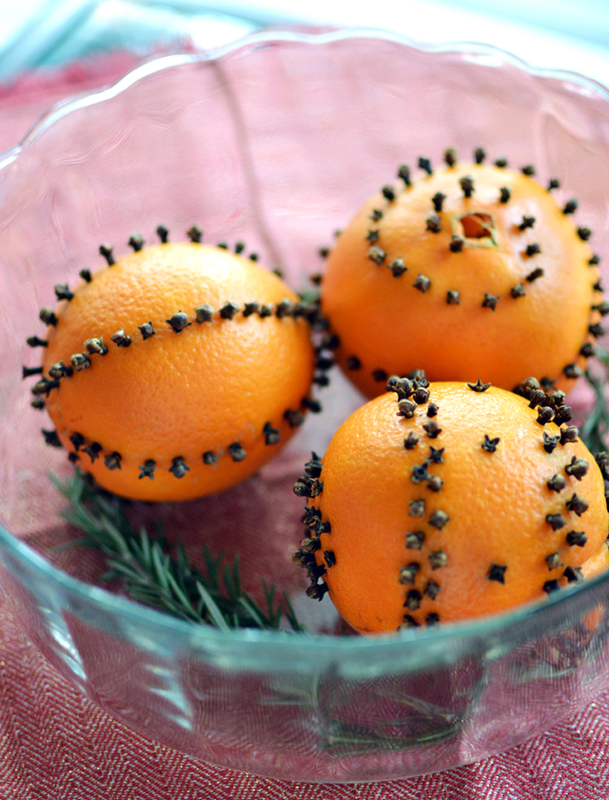 Want the smell of pomanders all year round? Well, you can get yourself a pomander candle too! 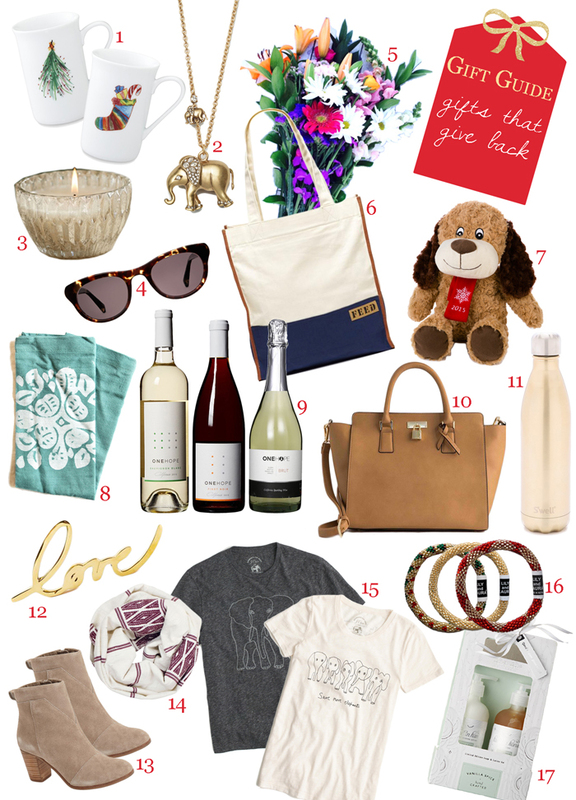 This may have been the easiest gift guide to put together this season so far because I am just loving everything of Lilly right now! Of course this is nothing new though! :) I love the new prints, all of the luxletic line, and the gorgeous cashmere! Explore more here, a gift guide sorted by price points! Puffer vests are such a great staple for fall through early spring and I love that this one comes in so many great colors! They also are lined with the Lilly prints you love! This scarf comes in a few different prints, but this Oh Shello print has been a favorite for resort. 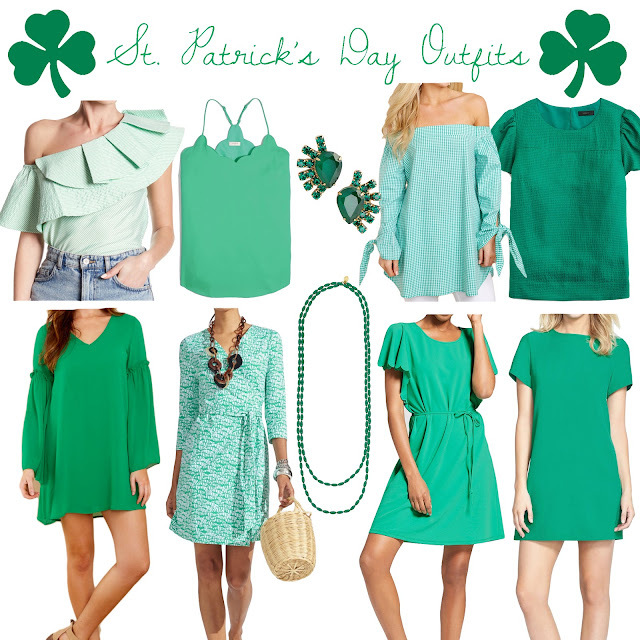 It has such a variety of colors so it can be worn with just about anything! I love the colors in this one and this one too and I have this one from last year in this iconic Lilly print! I shared this necklace in this post, but I always love a good tassel necklace and what better than a pretty pink one to wear with all of your Lilly favorites! The Elsa top is one of my favorite tops that Lilly makes because it is so versatile and can be worn through every season! 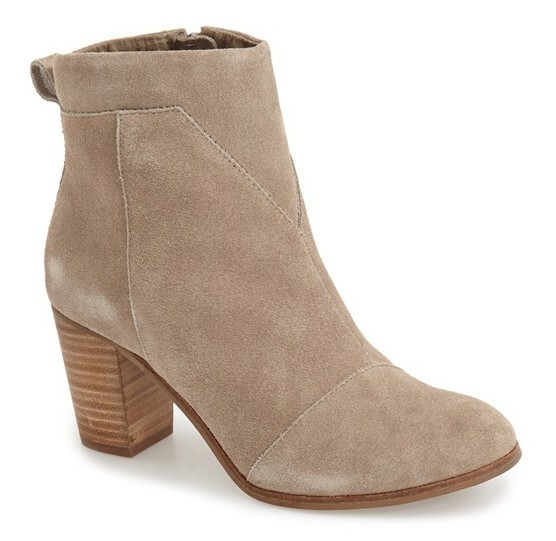 Wear it now with a pretty cashmere cardigan or tucked into a skirt and wear later with white skinnies or even shorts and sandals. This top is 100% silk so it is a little pricey but it's a great staple because it can instantly make an outfit look more put together. It is supposed to fit a little blousey so I would always recommend getting your normal size because going down a size so cause the bust to pull and sometimes the silk can start to tear because it is such a delicate material. They should only be dry cleaned by I can usually get away with a few wears before getting it cleaned by steaming it in between wears. Another favorite Lilly item in my closet is my harp wrap! This gorgeous cashmere wrap comes in a few great colors and makes such a great statement worn over a pretty Elsa, or just solid black or white! There are a variety of great Lilly tote bags available right now but I love this leather one because it's a little nice and a great neutral that could be worn with all of your fun prints and bright colors! These earrings are so cute and would make a great stocking stuffer or gift for a friend! This pretty pullover would be a perfect staple for those chilly days when you need more than just a light weight long sleeve shirt. A great case to store all of your makeup goodies for travel. It has two separate zip compartments and because of the great prints, you will always be able to find it in your luggage! Another great cashmere sweater for the season in some gorgeous colors. This tunic looks so cozy and like something you would want to wear every single day! Would be a great gift for mom! I love Lilly's Leona Zip Ups and Skipper Popovers and think that these fun prints make loungewear more fun! 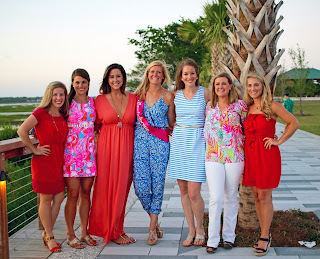 A few of my favorite Lilly looks- click image to shop! This past Tuesday was Giving Tuesday, which after the madness of the weekend sales was something that was very welcomed and much needed. I'll be the first to admit that's easy to get caught in the materialism and consumerism of the season but it's so important to remember that there are many out there that are living with so much less. To quote Michael Buble's new Christmas song (that I heard in my car while I was thinking about creating this post- meant to be!) "let's give love and get some back / the more you give, the more you'll have." I did a little research and found some great companies that are giving back to charities and organizations that need it most. 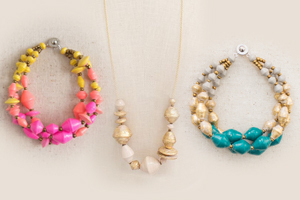 This jewelry company supports artisans in Uganda and the beads are made from recycled paper. A neat fact- their name "31 bits" stems from Proverbs 31, and the "bits" are their paper beads. Read about their mission here. Some of my favorite pieces are the Dharia Bracelet, the Twilight Necklace, and the Ivy Spritz Bracelet. 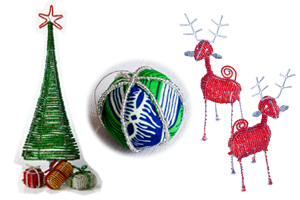 Amani ya Juu means "peace from above" in Swahili and this company is sells fair trade products made by women in Africa. Read more about their story here. They have some really unique handmade Christmas products, as well as this Batik napkin set, dish towel, and hot pad and spoon set. 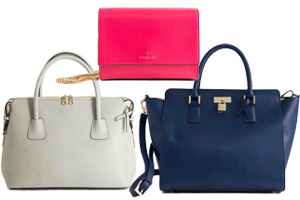 I think this handbag company might be one my favorite new finds! Not only are the bags gorgeous and less expensive than similar styles, but each different color gives to a different charity. For example purple represents Alzheimer's Disease so for every bag sold in this color, a portion is donated to Alzheimer's Foundation of America. They also support the Melanoma Research Foundation, Lung Cancer Alliance, Joslin Diabetes Center, National Kidney Disease, Prevent Cancer Foundation, Keep A Child Alive, Colon Cancer Alliance, Anxiety & Depression Assoc. 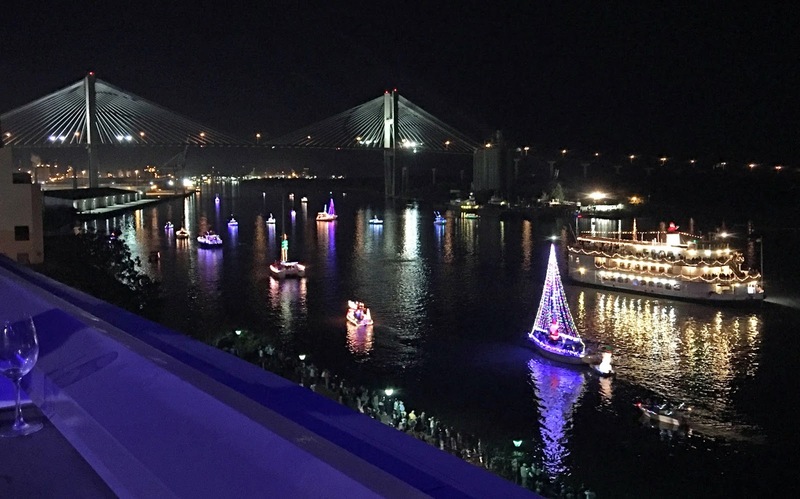 of America, Living Beyond Breast Cancer, and American Childhood Cancer Organization. Some of my favorite styles are Sunday Tote II in navy (also love the beige which is #10 in collage above and basic black) which supports Colon Cancer Alliance, the Moa Tote in light gray which supports the Joslin Diabetes Center, and the V Chain Cross-Body in pink which supports Living Beyond Breast Cancer. 50% of purchase price from this jewelry collection is donated to St. Jude's Children's Research Hospital from November 13, 2015 to January 30, 2016. 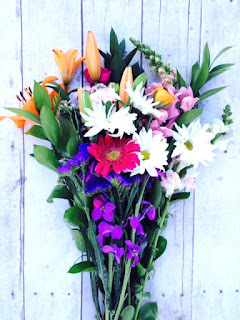 Each purchase of a floral bouquet goes towards flowers in hospitals, clinics, and other community organizations. With the purchase of their products, a certain number of school meals are donated to children around the wold. 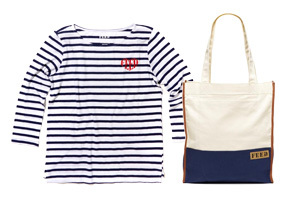 For example, the purchase of this women's striped boatneck provides 10 meals, and this shopper tote provides 15 meals. Read more about FEED's giving here. 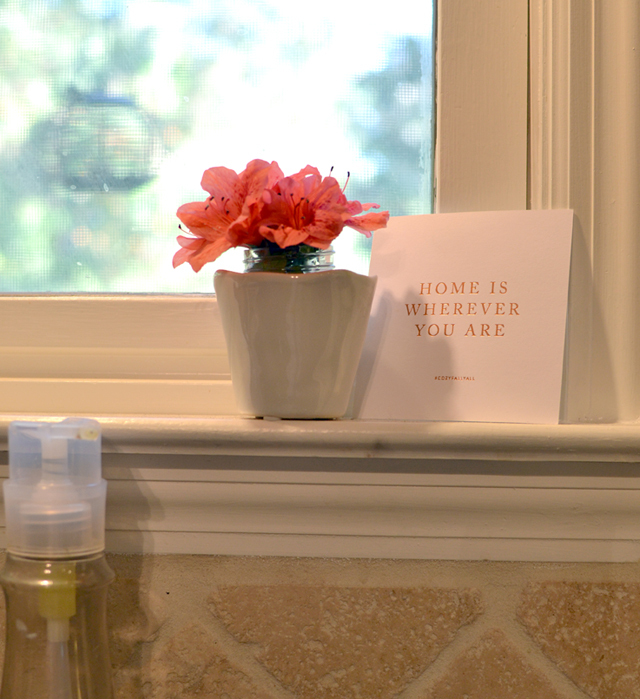 For every product purchased, Hand in Hand donates clean water and soap to children in need. Read more here. 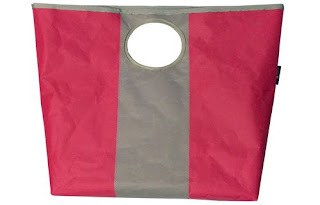 One of my favorite tote bag companies, Hayden Reis has a Limited Edition Breast Cancer Awareness Bucket Tote. 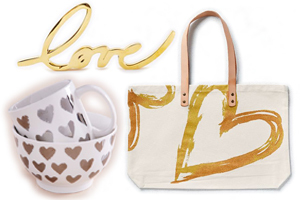 20% of the proceeds from this tote is donated to The Edith Sanford Breast Cancer Foundation. 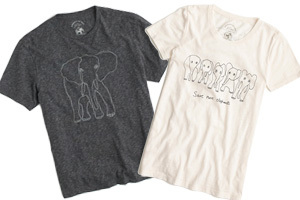 J.Crew is giving 100% of the net proceeds from these shirts to the David Sheldrick Wildlife Trust, an organization that rescues and protects elephants and rhinos in East Africa. Krochet Kids works to empower women who live in poverty stricken communities in Uganda and Peru. 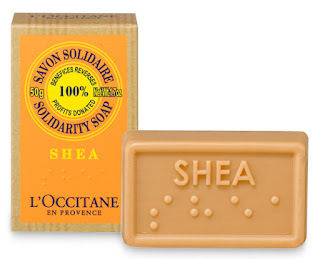 100% of profits from the sale of this soap is donated to organizations that work on eye health projects in developing countries. 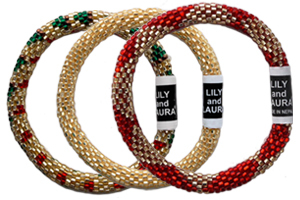 These bracelets are made by female artisans in Nepal and the proceeds support these women and their families. Read more here. 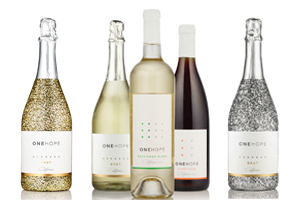 Another one of my new favorite finds, ONEHOPE Wine donates half of the profits from each bottle towards various charities. These glitter bottles are kind of the coolest AND each bottle provide 15 meals to a child in need. This Red Wine Gift Box would make a wonderful gift for the holidays, and every box helps fund ABA therapy for a child with autism. Read more about ONEHOPE Wine here. You can also buy ONEHOPE Wines directly on Amazon! 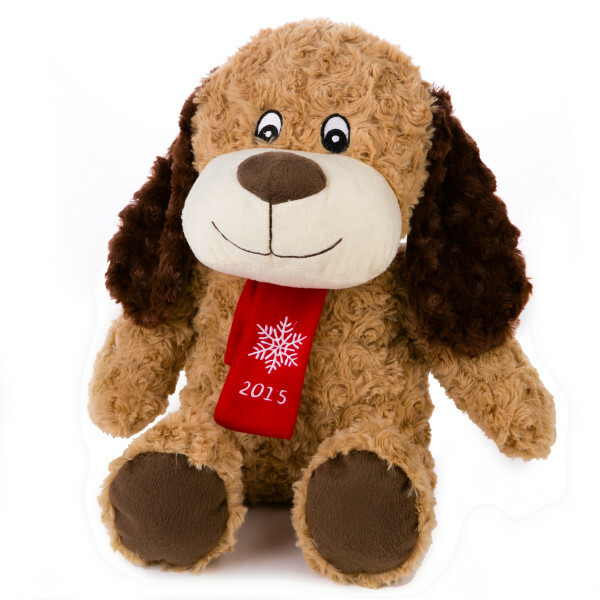 10% of the sale of these "Luv-A-Pet" products go to PetSmart Charities. Our local PetSmart also gives the option to donate these plush toys to Toys for Tots. 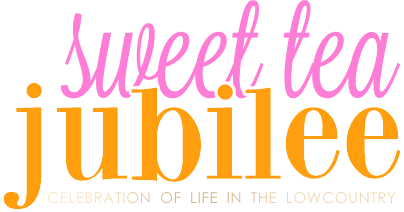 50% of purchase price from items in the St. Jude collection (including Mercury Candle Pot, Animal Ornaments, and Frog Prince Catchall) are donated to St. Jude's Children's Research Hospital. Products in their Give A Little Hope collection benefit shelters around the nation to provide temporary and long-term housing for youth and families. 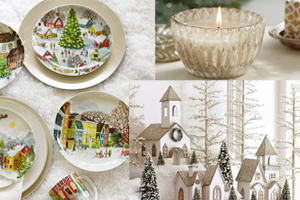 Products included in this collection: German Glitter Village Houses, German Glitter House Ornament, Winter Village Dinnerware, Napkins, and Platter. 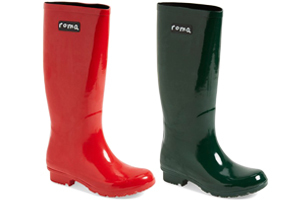 For every pair of boots sold, a pair is donated to a child in need. 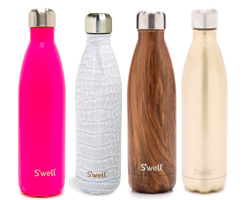 These stainless steel water bottles can keep cold drinks cool for 24 hours and hot drink hot for up to 12 hours. A portion of the proceeds from the sale of each bottle is donated to UNICEF to provide clean drinking water to children around the world. This gold Sparkling Champagne bottle is one of my favorites, but they come in all different colors and patterns like this Bikini Pink, Blanc Crocodile or Teakwood. Read more about S'well here. Sseko Designs is based in Uganda and helps provide young women with the opportunity to generate income and pursue a college education. 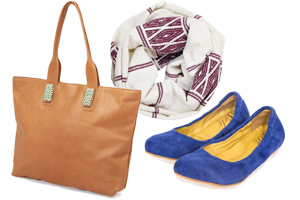 This tote or scarf would make great gifts and these shoes would be such a fun statement for you! They also come in pink or tan. Read more about Sseko here. For each pair of shoes purchased, a pair is donated to a child in need. For every pair of glasses sold, a pair is given to someone in need. 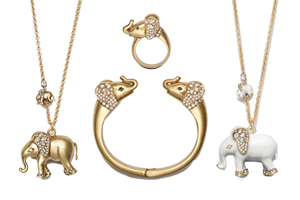 50% of these product's purchase price is donated to St. Jude's Children's Research Hospital. 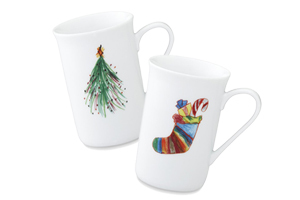 For every mug purchased, Williams Sonoma donates 25% to St. Jude Children's Research Hospital. Also check out the St. Jude Stocking Spatula! 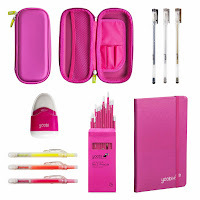 For every Yoobi item you buy, they will donate an item to a classroom in need. But of course you don't always have to buy to give back! You can donated unwrapped toys to Toys for Tots, throw some money into the Salvation Army kettles you see while you're out or online, or you can buy toys on Amazon for the Today Show's Toy Drive. What are some of your favorite ways to give back during the holidays and all year round? If you know of a charitable a company/product that you want to share on this list- please let me know!